We’d love your help. 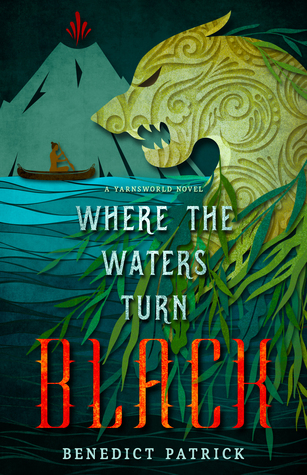 Let us know what’s wrong with this preview of Where the Waters Turn Black by Benedict Patrick. To ask other readers questions about Where the Waters Turn Black, please sign up. Edit: Full length review and an upgrade to 5 stars. As I sat and wrote this review and stewed on what I read I really feel this should be bumped up. I would have picked this book up anyway since I’ve already read, They Mostly Come Out at Night, which is book 1 in this series. Although this is a ‘sequel’, it’s really more of a stand alone story in the same world IMO, although there is a cross over character by the end, you don’t necessarily have to know who he is to get the story. I liked They Most Edit: Full length review and an upgrade to 5 stars. As I sat and wrote this review and stewed on what I read I really feel this should be bumped up. I liked They Mostly Come Out at Night, it had a unique story and it was creepy and a breath of fresh air with the folk tale mini stories, but it had some areas that could have used some improvement, like the dialogue. I’m really happy to say the dialogue in this book was great, this book is a full step ahead of the last book and it’s satisfying watching the author improve his craft, and I’m not the only one – the goodreads score for the second book is much better than the first. Kaiamana has just arrived back home after 3 years in the beginning of the story, and she’s approached by a little girl who tells her there’s a taniwha living in a cave up on the mountain side. Kaimana doesn’t believe the little girl at first until it was confirmed by her parents. She decides to go searching for the taniwha who’s believed to have killed several members of the Atoll society and she had been told not to go and seek him out. As it turns out, approaching the taniwha increased her magical powers, and she started to “spark” shortly after the encounter. The rest of the story focuses on her friendship with the monster, and the problems that causes with her society. She’s hunted down by gods who want to kill her taniwha which she names Rakau. I really liked this world he created, I can’t remember the last story that was told on an Atoll on a group of islands where people canoe from island to island of small populations. There are cannibals, monsters, and walking talking Gods. In this world the Gods walk among the people and interact with them, and there’s a god for everything, even yams. The god of Yams was one of my favorite side characters, a dejected low level sarcastic filled God of Yams, it was perfect. There were also folk stories being told within the story which added to the depth of the world. People who have a magical ability are known to have Knacks, and it could be for anything which is so unique and charming to read about (cooking knack, fishing knack, music knack), most magic systems give people these unbelievable powers and I really like this twist on the idea of magical powers. When you start to “spark” you’re going through a genius moment of your powers, and you excel beyond imagining- creating masterpieces if you’re a music knack for instance. I read this book very quickly, the book is under 300 pages and it’s meant to be a shorter more folktale like story. There were several very short folk tales used as interlude chapters that were maybe 5-6 pages long each. I lovelovelovelovelovelovelove this book. I love it as a reader who is always down for a good folktale retelling. And I love it as a Pacific Islander who hadn't realized until this moment how much they craved representation in their favorite genre. Loved it. A little backstory… I have been reading books out loud to my son and my wife since last December, and this was the latest book, following Rothfuss, Pratchett and Bancroft. I used to read a lot to my son when he was very young, and we got away from this practice for several years. I had asked some fellow reviewers for suggestions of what to read next, and Timy from RockStarlit BookAsylum suggested this author, Benedict Patrick. Neither of us had previously read any of his books. The creativity in the book with the various creatures was very well done. They were very well described, including how they looked and acted, and even down to the body language that was often interpreted as its form of communication. Honestly, there were times when the creature seemed more human than the people. I love to read. It’s my thing. Since I started reading out loud 10 months ago, there were plenty of times when my wife and son did not want me to read but I did, and we did something else as a family. (I’m OK with either option, really.) With this book, most days MY SON was asking when we could read more. It was a short book, it was well written, and it held his attention. After Benedict’s previous work They Mostly Come Out At Night I was left wanting..wanting more of his work. Fortunately for me and you the author hasn’t kept us waiting long..phew. We are back in the wonderfully dark and exciting world the author has created full of gods and monsters that will send shivers down small children’s backs. I loved this book. It feels like a fairytale.. but not the Disney kind.. the true kind.. think The Brothers Grimm. Myths told to scare the little ones come to life an After Benedict’s previous work They Mostly Come Out At Night I was left wanting..wanting more of his work. Fortunately for me and you the author hasn’t kept us waiting long..phew. I loved this book. It feels like a fairytale.. but not the Disney kind.. the true kind.. think The Brothers Grimm. Myths told to scare the little ones come to life and change the life of one person in particular..Kaimana. From the opening sentence I knew I would enjoy this – “There’s a monster in the village” and this author has a real knack for creating the weird and wonderful that switches on my brain giving me the blissful feeling of using my imagination to see this world myself. The tale is fast paced..would have liked it slowed down a bit so I could really enjoy the world and people the author has created but saying that the author has fit in a lot of content into less than 230 pages. So you’ll want to know a bit about the book..
First off one thing I really loved about the author’s previous work and this one is how he separates the chapters with little tales, myths, folklore from the world he’s created. I’ve not read anything like it before and it really shows off the author’s imagination to the fullest. Kaimana is part of a traveling group of performers. She has the knack but hasn’t reached her full potential yet. When the group heads back to her former home this is a chance to see her parents but she’s kind of an outsider in her own home since she didn’t follow in the family footsteps. This feeling of being an outsider is what I think draws her to go searching the woods when she’s told a monster is lurking..she just doesn’t think of the consequences . After disturbing the creature the travelling group are asked to leave and they head out to their next destination.. little do they know the taniwha has become connected to Kaimana. Kaimana is certain this connection is what is needed for her to become a legend..to create a song that will be shared for generations. Along the way on this adventure we meet gods..good and bad..and more monsters. We even see the Magpie King make an appearance :). I won’t spoil the overall plot for you but this was another well written tale from a strong author that you should definitely keep your eye on. The tale is one of friendship & loyalty and the fantasy edge really makes this one hell of an interesting book to read. Another plus for me is that the book is written in such a way that even though it’s connected with the previous tale you don’t have to have read that book first, you can read them in any order.. Although I’d strongly suggest you read it at some point..Damn it was good. Imagine a baby blue clear ocean, lots of sunshine, golden sandy beaches, canoes… coconut trees and colorful fish. People who live a simple life, believe, fear and celebrate gods. The Crescent Atoll is a laid back paradise of breathtaking sights… and yet… gods are not the only ones the people of the Atoll feel weary about, there are also the taniwhas. The monsters. Like many Atoll villages, Pukotala was a small collection of wooden huts thatched with dried palm leaves. It was a fishing settlement Imagine a baby blue clear ocean, lots of sunshine, golden sandy beaches, canoes… coconut trees and colorful fish. People who live a simple life, believe, fear and celebrate gods. The Crescent Atoll is a laid back paradise of breathtaking sights… and yet… gods are not the only ones the people of the Atoll feel weary about, there are also the taniwhas. The monsters. Like many Atoll villages, Pukotala was a small collection of wooden huts thatched with dried palm leaves. It was a fishing settlement, built on the edge of the tree line, to give easy access to the water these people needed for their livelyhoods…. Our main character is Kaimana. A young lady whose Knack for music took her away from her home island, Pukotala, to travel with a musical troupe across the Atoll islands to perfom songs about the gods. She is now back on Pukotala, preparing to perform to the people she grew up with and to her parents, to prove to them that her Knack for music is what she should pursue not the simple life as a wife to a fisherman. Having a Knack is all well and good, but Kaimana needs the Spark. She needs something to spark the Spark, to compose the musical piece that would make her known across the islands. That is her goal. The search for inspiration is what makes Kaimana act, against everyone’s wiches and warnings, and she can’t help herself but go check out that cave where the alleged taniwha now lives. And for me, this is where the truly magical part of the story gets its beginning. The taniwha Kaimana finds looks like a log… a tree stump… but huge! Gray-ish in colour, but covered with moss here and there, and has some destructive limbs… No one knows where taniwha come from, how long they live or if they have families… But it is a long known truth that the taniwha are dangerous, very dangerous in fact and no one can be sure if they can be trusted. Due to some unfortunate events, Kaimana finds out the taniwha of her island is after her. Is Rakau following Kaimana to kill her and her travelling troupe? How will the troupe act and feel when they find out the taniwha is after them… Is it all Kaimana’s fault for waking the monster? It was a clear night, the moon was full, and the crystal water of the reef was undisturbed by any nearby rivers. The moonlight painted the rocks and coral of the reef a pale blue, and this was strongly contrasted by the powerful green of Rakau’s eyes, which illuminated the sea bed and even tinted the water in front of him. As if the situation doesn’t seem odd and scary enough, Nakau the pig-headed War God doesn’t take lightly to the fact that his temple now has a gaping hole in its wall! And Kaimana’s troupe isn’t happy either… the performance for the pig god was their biggest event yet, in years! So, who’s to blame? The inner dynamics of the troupe members also come into play and it’s weaved into the story perfectly! A chase for revenge by Nakau and his army across the seas surrounding the Atoll Islands starts, throughout the story of Kaimana’s survival, myth and folk tales mix with current events. The Birdmen of the Broken Island, the gods of volcanoes and farming and song, the Lava Racer and many more legendary tales strategically placed n between scenes of Kaimana’s journey. And it is a journey to capture her Knack’s Spark and finish the Song, to stay alive, to find shelter for her friend. ‘Where Waters Turn Black’ is fantastically imaginative and beautifully fluous, taking me on a journey unlike any other. I'll be honest with you. I didn't like They Mostly Came at Night. Parts of it were great, but, overall, it just didn't work for me. As a result, I decided not to read more Yarnsworld novels. Obviously, things changed. Why? Well, last year I read two anthologies - Lost Lore and The Art of War - and in both cases, Benedict Patrick's short stories were among my favorites ones. Additionally, I'm keen on r/fantasy Book Bingo Challenge and one of 2018 squares is Novel Featuring a Protagonist Who is a I'll be honest with you. I didn't like They Mostly Came at Night. Parts of it were great, but, overall, it just didn't work for me. As a result, I decided not to read more Yarnsworld novels. Additionally, I'm keen on r/fantasy Book Bingo Challenge and one of 2018 squares is Novel Featuring a Protagonist Who is a Writer, Artist or Musician. In other words, I had no choice. I simply had to give Where the Waters Turn Black a try. The main character is an artist - ocarina player. The story is inspired by the myths and legends of South Pacific island cultures, and that's a plus as it's not the kind of setting we see often in fantasy books. The story focuses on Kaimana, a young ocarina player, who discovers the lair of a taniwha (a dangerous, predatory being). She feels this encounter may finally allow her Knack to spark and create ocarina masterpiece. Unfortunately, things go off the rail really fast. Kaimana is cast away from her troupe, god of war wants to kill Taniwha. A girl and a monster will have to learn to trust each other in order to survive. While the plot isn't particularly complex, it remains enjoyable and well paced. It reads a bit like a folktale and it's the story's main strength. I enjoy this kind of storytelling a lot. For me, it's the story about finding your place in life and the importance of true friendship. Kaimana and Rakau relationship was a bit predictable but also real and touching. Some level of predictability is fine when the story manages to emotionally engage me and it did. The setting is unusual and exotic - the Crescent Atoll is a remote string of tropical islands inhabited by humans, monsters, and gods. Gods of the Attol aren't loving and caring - they're mostly cruel, vain and callous. We learn about them through short chapters retelling some of the myths and legends. Characters were easily relatable and, mostly, likable. Kaimana is part of a traveling group of performers. She has the knack but hasn’t reached her full potential yet. When she meets Taniwha her first motivation is egoistical - she wants to create an ocarina masterpiece that will make her famous. With time, though, she makes a lot of difficult choices that will change her life and values forever. I liked her and related to her. She's a bit of an outsider, but she has the heart in the right place. Also, she's a good buddy of a mythical monster and I have a soft spot for human-familiar relationships. Rakau is a giant monster able to wreak havoc and bring mayhem, but with Kaimana, he behaves like a playful puppy. Yam was funny. Attol gods were portrayed with broad strokes, but we clearly see the differences between them and their respective characters. I guess my only character-related issue was Eloni - she's just mean and envious and, basically, there's not much more to her. As one of the story "villains" she felt very flat. Overall, I'm glad I read this book. It was short, tight and wildly entertaining. A beautiful Polynesian-inspired fairy tale, with plenty of humour and pathos. Plus, I totally pictured the protagonist as Disney's Moana. I knew I would love this story from the first page. It is hard to describe the beauty in this piece, as there is so much. The characters, their lives, their culture, their faith, their journeys—all of it is a culmination of everything you would want in a dark—yet somehow lighthearted—book of fable, folklore, and myth. It has just the right mix of adventure and mystery, friendship and hurt, joy and wonder. It all comes together so well—perfectly woven as if from threads taken from the hem of a robe worn by one of the powerful gods in this story. The protagonist here is a young woman named Kaimana who is a musician travelling across the islands with the hopes of making it big. What she’s searching for besides fame, however, is inspiration. Kaimana needs the perfect spark to fuel the magic of her music so she can’t keep herself still for long when she hears rumors of a taniwha living nearby. Taniwha are rumored to be dangerous monsters that have beaten fear into the many Atoll villages. What Kaimana finds, though, is not what she expected at all but it takes her career and her entire life in a new direction. We get to see a beautiful mixture of rich culture, wild imagination, and adventurous legends put together by Patrick. I’m a huge fan of ‘They Mostly Come Out at Night’ but I must say this work gives it a run for its money. Patrick’s writing is so solid and layered in its beautiful simplicity. I absolutely love the beginning of the book; a simple conversation between a toddler and Kaimana. There isn’t always much description as far as appearances go in Patrick’s writing but it is deliberate, as if letting readers fill in the blanks. That is an aspect of Patrick’s writing that I am learning to look forward to. There aren’t many books I get to simply read and enjoy while I poke and prod, putting together my review, but this is definitely one that I loved. I don’t think I can truly do any work of Patrick’s justice with a simple review; it is something you must witness for yourself. I ask, from the bottom of my heart, that readers pick up a copy of this book. Disclaimer: I won a paperback in a Goodreads giveaway from the author. This has not affected my review. I thoroughly enjoyed the immersive South Sea fantasy, where only entertainers range widely between islands and gods walk in, magical realism style, if their name is slighted. A young musician who left her fisher family for a more exciting life has to wait for a creative Spark of inspiration... which only seems to arrive after she disturbs a big scary doglike monster in a cave. While doing dama Disclaimer: I won a paperback in a Goodreads giveaway from the author. This has not affected my review. Too many setting changes and characters for me to describe them, but if you ever dreamed of island hopping and finding a different environment and clan on each beach, this is your book. Interspersed legends, which are relevant to the tale, explain how the peoples pass on information, like stay away from live volcanoes, watch for giant sharks, and be sure to water the yams. The author, who is from Northern Ireland, says he spent a summer with the native tribes of New Zealand learning their customs and lore, which inspired this vivid fantasy and stunning legends. Full of folkloric charm and a classic tale of the triumph of virtue. The Odyssey meets Free Willy--an adventure between unlikely friends into mysterious lands inhabited by strange, fantastical creatures and capricious gods. Evoking breathtaking imagery, moving fluidly (or swimmingly, if you prefer) from one exotic setting to another, a testament to a very thoughtful worldbuilding. The writing is similarly thoughtful and deliberate, sophisticated and lyrical. Particularly interesting was the relati Full of folkloric charm and a classic tale of the triumph of virtue. The Odyssey meets Free Willy--an adventure between unlikely friends into mysterious lands inhabited by strange, fantastical creatures and capricious gods. Particularly interesting was the relationship between a god's stature and human interaction, perhaps a statement about the symbiotic nature of worship and divinity, an interesting jumping point for reflection on the nature of gods. One word: Awesome !!! Thanks for the ARC Benedict Patrick, Now I will have to buy the book to see if anything got changed! :) It's on my Christmas wish list at Amazon! Let me start of by saying I love Yarnsworld, this book follows the same format as They Mostly Come Out at Night in how it alternates a chapter of story then a short folk tale from the area the story takes place. Having read They Mostly Come Out at Night I loved the story but I had some issues with the actual writing, primarily the dialogue it. Those issues are not present in this story and the flow of the story benefited greatly from this. Kaimana the main character has a knack for music, she pl Let me start of by saying I love Yarnsworld, this book follows the same format as They Mostly Come Out at Night in how it alternates a chapter of story then a short folk tale from the area the story takes place. Kaimana the main character has a knack for music, she plays the ocarina with a troupe of performers. They travel the islands performing for different villages. The story begins when her troupe returns to her home island to perform for a festival. It tells a tale of Kaimana and how she befriends a monster and goes on an adventure to find her song. Kaimana is an amazing character and her journey is packed full of gods, near death experiences and wonderful emotion. The folk tales that are contained in here are amazing all on their own. I would definitely read a Yarnsworld book that was just the lore from different parts of the world. But having this in between the chapters really does a lot to build the world and fill it with history. Such a great idea to do this. The Brothers and the Sea, Laka's Dancing Boy and The First Canoes are my favorites but they are all great. The cover was awesome as well. The cover of They Mostly Come Out at Night is what originally brought the series to my attention. I thoroughly enjoyed this book and have been recommending it to pretty much anyone I know who reads. I am looking forward to the next book Those Brave, Foolish Souls from the City of Swords, which I will be starting as soon as I post this. This book is set in the same world as the first novel of this author, They Mostly Come Out At NightThey Mostly Come Out At Night. What drew me to them was the combination of the beautiful cover and enticing title, to be honest. I stayed for the folklore, fairy tale vibe, and setting. This book is set on Atoll, a series of closely situated islands, where capricious gods walk among their worshipers. Our protagonists are Kaimana, the ocarina player, and a taniwha: a strange being that is seen both as protector and a monster to be feared (it bring me such joy to learn it comes from Maori tradition). From the moment they meet the curtain is truly lifted and all of the things start happening all at once. Lots of traveling, meeting with gods, fending off fish monsters, battling warriors of the pig god.... And all of it under 300 pages, including the short stories included between the chapters! This book has much better dialogue than the first book, and the scenes with the characters felt more real overall. I grew to like our protagonist, who I found to be a self-absorbed teenager at the beginning. She grew from her experiences, accepted her mistakes, and moved the plot forward. The side characters were also interesting - especially the interactions between the gods, which was not as developed as I'd have liked. I mean, who woudln't want to know more of god family squabbles? I grew up on Greek and Slavic myths, I adore that stuff. Also, I would have liked to have more scenes of Kaimana and tanihwa together - Kaimana's feelings towards it change, but it was quite abrupt and I would have liked to feel it more. This book left me feeling quite exhilarated, and I'm really glad I found this author and plan to read everything he puts forward in the future. When Kaimana left her tiny island, all she’d wanted in life was to prove herself; to her parents, to goddess Laka of song and dance, to her knack and to herself. However, that journey is derailed by a single moment of curiosity. The moment she looked into the green eyes of the wooden Taniwha, Kaimana should have known that life would never be the same. A tale of courage, a tale of an arduous journey, a tale of friendship between a girl and a monster. Set in the universe of Benedict Patrick’s pre When Kaimana left her tiny island, all she’d wanted in life was to prove herself; to her parents, to goddess Laka of song and dance, to her knack and to herself. However, that journey is derailed by a single moment of curiosity. The moment she looked into the green eyes of the wooden Taniwha, Kaimana should have known that life would never be the same. A tale of courage, a tale of an arduous journey, a tale of friendship between a girl and a monster. Set in the universe of Benedict Patrick’s previous works, Where The Waters Turn Black tells the story of an unusual, but heart-warming friendship. I picked up this book because it was fantasy and it seemed to have an interesting female lead. I was proven right on both counts and on so much more. The setting of the atoll and the pacific islands draws you in immediately. The background is provided with an ease that is much coveted in the guilds of fantasy writing. More importantly, the lead character, Kaimana, is presented so well that you’re rooting for her by the end of the first chapter. Even if I hadn’t liked the story, I would have kept reading for the sake of Kaimana and Rakua. The determination and courage of Kaimana is astounding and that is where she shines. But, when the time comes for fear or sadness especially, the author falters a bit in the transition between emotions. It feels a little abrupt which stands out because everything else reads so natural. The story is one we are all familiar with. But, maybe it’s the vivid representation of the pacific islands, the rich history that is presented in the form of intersecting Tales from the Atoll chapters, or maybe, it’s because of the refreshingly human protagonist, but, I enjoyed Benedict Patrick’s work a whole lot more than I thought I would. BOTTOMLINE: The story is captivating. The protagonist and other characters are brave and very human. The world-building is fantastic. The prose is easy to read. What else can a reader ask for? Give it a read on a hot summer afternoon and lose yourself in the beauty of the clear blue waters of the Atoll. Kaimana is a likable character but more importantly she feels real. Her decisions aren't always perfect but there is something of a dreamer in her that is to be admired. Rakau is the tanwha and has a big personality. He reminds me of a big intelligent dog. The supporting characters are varied but most seems to be morally reprehensible characters. From her parents that can't understand to her 'mentor' Eloni (who is a real twit). This book was such an array of themes. At its core I felt this was about the power of love/friendship. That it doesn't matter how different you may be from another person/creature, sometimes there is a connection that only you and the other person/creature can understand. It was a beautifully refreshing novel. There wasn't any romance, it was just the story of a girl and her monster. The world building was breathtaking and the transitions clear. I was a little disappointed that the fairy tale like stories didn't connect back into the story more, but it did well enough to be fantastic. The Gods were varied and complex in their own right. I cannot give this book enough praise. I don't want to give anything away, you'll just need to read it! If you love Folklore stories even a little this is a must read! I couldn't put it down and once I started reading it I had to finish. A must read! My primary complaint about the first Yarnsworld book was that I never was able to connect to the main characters. This standalone sequel (yep, that's right) rectified that. While it took a few pages to sink into this, I found myself thoroughly compelled by Kaimana's story. The opening was a bit slow and I found Kaimana's inner thoughts to be repetitive, but by the time Kaimana had made the decision to leave the troupe of performers, I was eager to see where she would take me. The setting of this My primary complaint about the first Yarnsworld book was that I never was able to connect to the main characters. This standalone sequel (yep, that's right) rectified that. The setting of this story is fascinating, immersive, and just as much a character as Kaimana. And like They Mostly Come Out at Night, the folktales woven from and around the islands were delightful and, best of all, grasped the tone and style of folktales so well. Dark, mysterious, and with just enough outlandish truth, these feel ancient. OMG where should I start? I loved this book, even better than They Mostly Come Out At Night. It was the perfect summer read for me: it was full of adventure, sea, mithology, interesting creatures and characters and short stories supporting the main story. I'm quite drawn to water (I'm an aquarius, go figure) and immensly enjoyed traveling around the Atoll with Kaimana and her friend Rakau, learning about the islands and their mithology. I could see where the inspiration come from (even before re OMG where should I start? I loved this book, even better than They Mostly Come Out At Night. It was the perfect summer read for me: it was full of adventure, sea, mithology, interesting creatures and characters and short stories supporting the main story. I'm quite drawn to water (I'm an aquarius, go figure) and immensly enjoyed traveling around the Atoll with Kaimana and her friend Rakau, learning about the islands and their mithology. Let me start with a frank experience: I couldn't put this book down. The moment I flip over the the first page of the first chapter to the second, I couldn't put the damn good book down till the last page. (which leaves me quite emotional on how many twists were developed..) In between each chapters, Benedict slips a short folk tale which is quite unusual for writers and truthfully, I skipped the 2 last tales of the book.. BECAUSE THE MAIN STORY'S REAL GOOD. Trust me, I rarely finish a reading i Let me start with a frank experience: I couldn't put this book down. The moment I flip over the the first page of the first chapter to the second, I couldn't put the damn good book down till the last page. (which leaves me quite emotional on how many twists were developed..) In between each chapters, Benedict slips a short folk tale which is quite unusual for writers and truthfully, I skipped the 2 last tales of the book.. BECAUSE THE MAIN STORY'S REAL GOOD. Trust me, I rarely finish a reading in a single sitting and I'm very picky. I am a big fan of Patrick's first book and was kind of disappointed he wasn't returning to the Magpie King. I didn't need to worry. This is another excellent book set in the Yarnsworld universe. While They Mostly Come Out at Night was dark, Where the Waters Turn Black is more hopeful, a little brighter. Kaimana is a character you will fall in love with as she navigates the atoll and all its wonderful creatures. I found the setting unique for a fantasy and it had a real fable/fairytale kind of fee I am a big fan of Patrick's first book and was kind of disappointed he wasn't returning to the Magpie King. I didn't need to worry. This is another excellent book set in the Yarnsworld universe. While They Mostly Come Out at Night was dark, Where the Waters Turn Black is more hopeful, a little brighter. Kaimana is a character you will fall in love with as she navigates the atoll and all its wonderful creatures. I found the setting unique for a fantasy and it had a real fable/fairytale kind of feel. And then there's Yam. Every time he steps on the stage, his witty, sarcastic comments steal the show. Maybe one of the greatest strengths of this book is I would let my daughters read it on their own. There is no objectionable content and that is a rarity today. 4.5/5 stars for me. This was a highly enjoyable read! Also, I swear I'm not choosing books for their cover, but I'm on a roll with the gorgeous covers lately. The cover of this book is fabulous (just as book 1, They Mostly Come Out at Night) was. Very striking! Short Summary: This is the second book in the Yarnsworld universe/series, however each of the books in the series are designed to stand alone and so far they do that very well. There is only one crossover character from book 1 who shows up 4.5/5 stars for me. This was a highly enjoyable read! Also, I swear I'm not choosing books for their cover, but I'm on a roll with the gorgeous covers lately. The cover of this book is fabulous (just as book 1, They Mostly Come Out at Night) was. Very striking! Short Summary: This is the second book in the Yarnsworld universe/series, however each of the books in the series are designed to stand alone and so far they do that very well. There is only one crossover character from book 1 who shows up in book 2 and you will not be at any disadvantage if you didn't know his backstory from book 1. The thing the books in this series have in common is a great device the author uses of putting a short fable or folk story of the world he's writing between each chapter. I love, love, love this method of adding to the world building. The other thing the books have in common are sparks of talent within the ordinary population of the Yarnsworld, Knacks for various things (woodworking, metalsmithing, fishing, pearl-diving, music, dance, etc). Setting: The Crescent Atoll, a string of islands surrounding a central volcano and the shallow waters around the islands and the deeper waters toward the center of the ring and outside the ring. This is a very Polynesian feeling setting and the author mentions the story was inspired by New Zealand and stories from that area. Characters: Our main character is Kaimana, who has a Knack for playing the ocarina. Musician knacks can be a little tough for the musician as they are more like the spark of inspiration to compose a truly memorable or great piece of music. They are far less likely to show routinely or on demand. Kaimana comes from a fishing/pearl-diving family on the Atoll and went against her family's wishes to join a performing group as a musician. She very much wants her Knack to spark to prove herself and prove to her parents she made the right choice. This leads her into making some foolish or selfish decisions along the way that introduce us to the second main character, the taniwha (monster) named Rakau. Other characters in the book are Kaimana's family, the players in her troupe, and quite a few gods who commonly walk among the islanders, including the very memorable Yam, god of yams. Plot: In very general terms (because I hate spoilers), this is a plotline that revolves around nurturing your creativity, finding your place in the world, and truly identifying what brings you happiness and sometimes figuring out the thing that brings you happiness may not be the thing you've been striving to attain. There's a good bit of travel between islands, interactions with gods and monsters, and a great friendship storyline. Style: This is a relatively short book, weighing in at 218 pages, so it's a fast read. The chapters and the interspersed folk tales tend to be short and pithy. I did think it was interesting that both the folktales from this region (both original and as imagined or re-imagined by the author) show the gods as being extremely callous toward the lives of the islanders. To some extent this was also mirrored in the narrative. Also, I think it's an important note that even though this book features literal monsters (taniwhas), this book had far less of a creepy/horror feel to me than They Mostly Come Out at Night did. Possibly because the settings are so very different (islands/water to me are far less creepy than impenetrable forest). With this book Benedict Patrick has secured himself as one of my favourite authors. This book has a wonderful cover that ties it into the first in the Yarnsworld series but also makes it feel different. Although I know they say you shouldn't judge a book by its cover, I think you can put stock in how much effort was put into the cover and here there's a lot of thought and effort on show. The book itself follows a similar set up to They Mostly Come Out At Night in that there are miniature stori With this book Benedict Patrick has secured himself as one of my favourite authors. The book itself follows a similar set up to They Mostly Come Out At Night in that there are miniature stories nestled in between the chapters and they are, just as before, wonderful little fairy tales that expand the world as we go. It almost feels like a mix between the movies Moana and How to Train Your Dragon but all grown up. And I mean that in the best way; I loved both of those movies for different reasons and this book brings those reasons together. It's a fresh setting; the Crescent Atoll is not another fantasy set in a kind of medieval Europe. And the monsters in the stories are all wonderfully different and just reasonable enough to be relatable but also able to turn into the monsters from stories in an instant. The gist of the story is that Kaimana, an ocarina player in a travelling troupe of performers, wanders off before a big performance to find a taniwha - a legendary monster. The taniwha are mythical but also part and parcel of life in the Atoll and some villages/islands live peacefully alongside taniwha if they leave them alone/offer them food every now and again. But of course, Kaimana's encounter with a taniwha doesn't end well and sets off the book's story proper. Benedict Patrick's writing is clear, concise and pulls you in straight away. Although the setting is different to anything I've personally read before it felt familiar and comfortable almost at once. There are some lovely phrases in here which I like to have in a book and there was at least one moment where I got goosebumps. I loved Benedict Patrick’s debut They Mostly Come At Night and so I was even more excited when WTWTB was in my lot. The story focusses on Pukotala and the neighboring Atoll islands OVERVIEW/ANALYSIS: Where The Waters Turn Black by Benedict Patrick has many things going for it. It’s the winner of the best cover in the 2017 SPFBO competition as well as it’s a very unusual cross between Moana & the Brothers Grimm fairy tales. This book while being a standalone is set in the Yarnsworld setting. I really enjoyed the darker and grittier feel of the first Yarnsworld novel, so I wasn't sure how much I would like this one from the blurb. However, once it got rolling it easily became my favorite of the two. Instead of a bond between potential lovers like the first book, this is one of a bond between a young women and a monster. This again focused on what lengths one would go in order to protect that friendship regardless of the circumstances and I felt the author did this very well. Another t I really enjoyed the darker and grittier feel of the first Yarnsworld novel, so I wasn't sure how much I would like this one from the blurb. However, once it got rolling it easily became my favorite of the two. Another thing, is the Knacks are more on display here and play a critical role in the novel. I felt in the first one they were there, but not much depth was given to them. Here, they go into more detail and what is like to have a spark going in someones head. I felt it was really interesting to follow. Okay, I'll come right out and say it - I LOVED this book. Like, actually, completely loved it. There's just something about the whole girl and her odd friend going on adventures that satisfy my every story craving, and this was no exception. It was full of adventure, Kaimana was just a lovely protagonist and Rakau was a lovely monster! Some highlights - I loved Yam too. The forgotten god who doesn't want to be forgotten but just needs that extra push to get there. And him joining in the adventure Okay, I'll come right out and say it - I LOVED this book. Like, actually, completely loved it. Some highlights - I loved Yam too. The forgotten god who doesn't want to be forgotten but just needs that extra push to get there. And him joining in the adventure when it seemed like the last thing he would ever want to do... perfect. Also, that ending was perfect. I won't spoil it because I shouldn't, but it's just great and left me feeling warm inside. Another great Yarnsworld book ... looking forward to the next one. I really like folk tales and fables so these fantasy versions of folk-tales are great. This one was inspired by Maori myth and legend apparently - although I only recognised the Taniwha as Maori, As a naturalised Kiwi and mother of three Kiwi kids this was an especially lovely tale. Definitely a Polynesian inspired story. Rarely in the stories did mortals fare well when concerning themselves with the affairs of gods and monsters. Second instalment of Yarnsworld (I really liked the first). Another folklore inspired tale in a completely different setting to the first - this one taking place on a collection of islands, with people similar to the Maori - quite unique and interesting. There are giant monsters, God's walking the earth and living amongst the people, and mortals who receive magical type inspiration for their 'gifted' vocations. There are some small crossovers connecting the books, so I'm thinking the premise may Second instalment of Yarnsworld (I really liked the first). Another folklore inspired tale in a completely different setting to the first - this one taking place on a collection of islands, with people similar to the Maori - quite unique and interesting. There are giant monsters, God's walking the earth and living amongst the people, and mortals who receive magical type inspiration for their 'gifted' vocations. There are some small crossovers connecting the books, so I'm thinking the premise may be its a large world and we are hearing about different parts of it, but it's not a series in the traditional sense so far. I didn't connect with this tale as much as the first, but that is purely a personal preference for setting I think. The story is a good one. The female protagonist is likeable enough, though the stars of this tale for me are one monster, and a particular God I found amusing. Again a quite short and easy read, which I'm liking at the moment. He has been writing for most of his life, and has been reading for pretty much all of it (with help from mum and dad at the beginning). Benedict's life changed when a substitute primary school tea Benedict Patrick is from a small town in Northern Ireland called Banbridge, but has been living and working in Scotland since he moved there at the age of eighteen. Tragically, that was quite a while ago. He has been writing for most of his life, and has been reading for pretty much all of it (with help from mum and dad at the beginning). Benedict's life changed when a substitute primary school teacher read his class part of The Hobbit and later loaned him the book – he fell in love with the fantasy genre and never looked back.